“How about: It’s quality, not quantity?” my dad proposed, wearing a grin. We were brainstorming city slogans for Loyalton, California, my hometown of 800 people nestled in the Sierra Nevada mountains—now named “the Loneliest Town in America.” We all laughed. On the surface, country living seems like paradise, but in reality a myriad of issues affect rural communities across the nation. Employment opportunities are sparse, lower income leads to higher instances of poverty, and—consequently—there is a clear demand and absolute need for higher quality education. 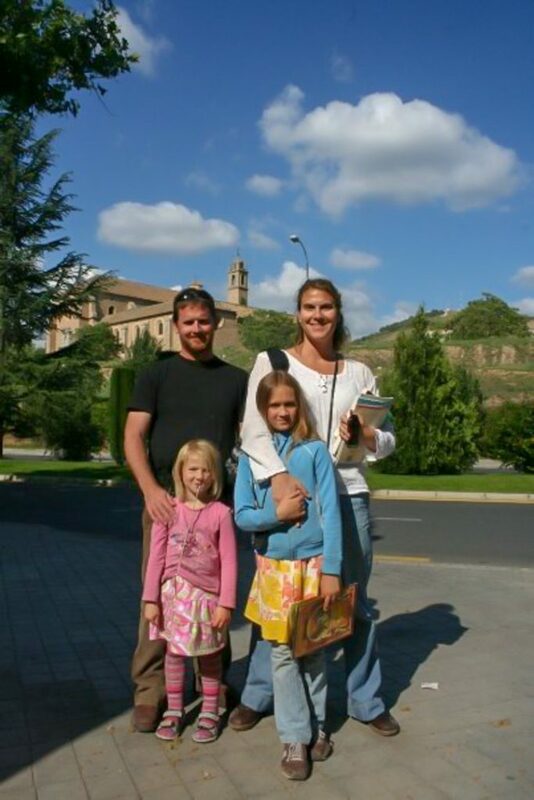 Megan Meschery and her family in Spain, 2008 Fulbright program. When the town’s sawmill closed in 2001, followed by a mass population exodus, Loyalton’s tax revenues declined rapidly and ancillary school programming disappeared with them. First, we lost music and art specials. Later, our middle school was condemned, and students were moved from portable buildings into the high school, losing their separate facilities entirely. In truth, it has only been through the extraordinary efforts of dedicated teachers and community members that our school district has been kept afloat: teachers like my high school Spanish instructor, Megan Meschery, who are determined to redefine our local community without much funding from state or federal agencies. In 2008, Megan left for a Fulbright grant in Granada, Spain, where she examined how rural economic development funding provided by the European Union reduced inequalities in public schools regardless of geographic location. She sought to find parallels and lessons applicable to rural education in America and to develop ways to promote cultural awareness and growth in Loyalton. 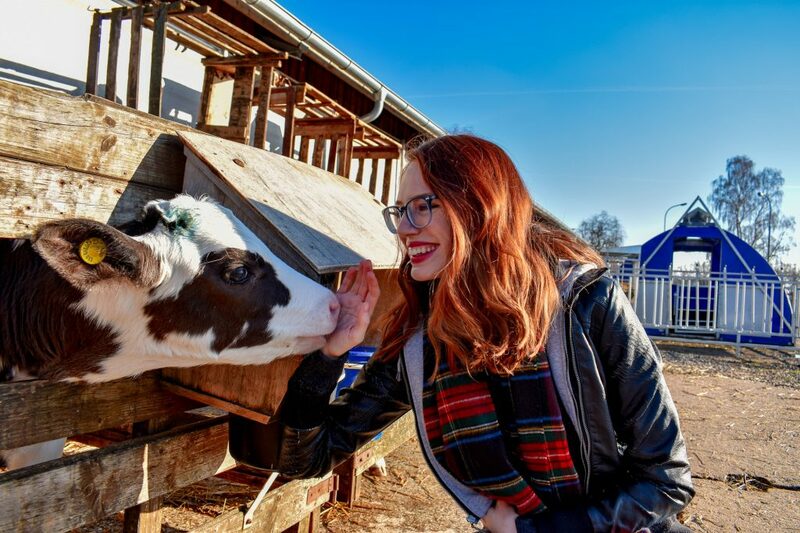 While Megan’s experiences rather highlighted the differences between U.S. and EU development models, Megan also returned from her two-year Fulbright burgeoning with ideas tailored to Loyalton’s situation, and immediately found ways to introduce positive change, starting with school electives. 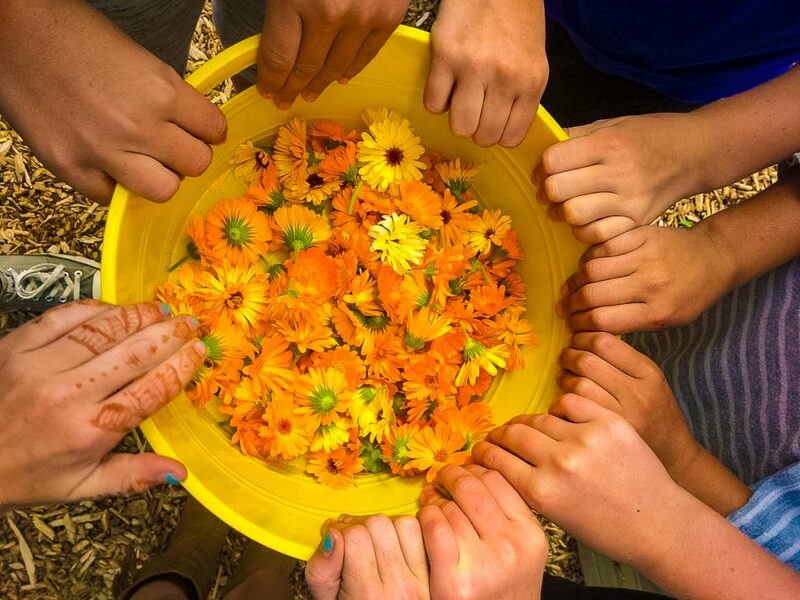 The Sierra Schools Foundation sponsors hands-on learning opportunities like harvesting chamomile tea flowers in the Loyalton Learning Garden. My favorite memories from high school are from the culture club she initiated, through which I saw my first Broadway play, Wicked, and visited my first classical art exhibit, featuring masterpieces from Rembrandt and Raphael. These experiences opened my eyes to the world beyond our tiny valley, and change did not stop there. The following year, Megan founded a non-profit organization called The Sierra Schools Foundation (SSF – sierraschoolsfoundation.org) to combat inequality in the school district by providing grants for resources and programs such as the STEM Learning Garden, Local-Artists-in-the-School, Advancing to College SAT prep, and others. 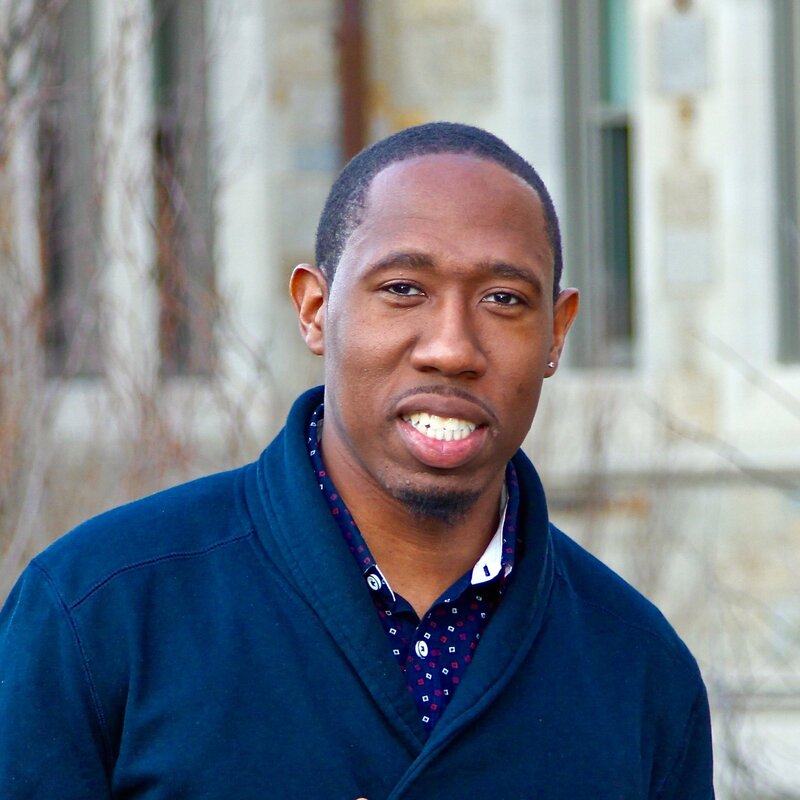 I volunteered with SSF throughout college, running fundraisers, where I witnessed firsthand how, with dedication and perseverance, local organizations genuinely have power to initiate positive change. 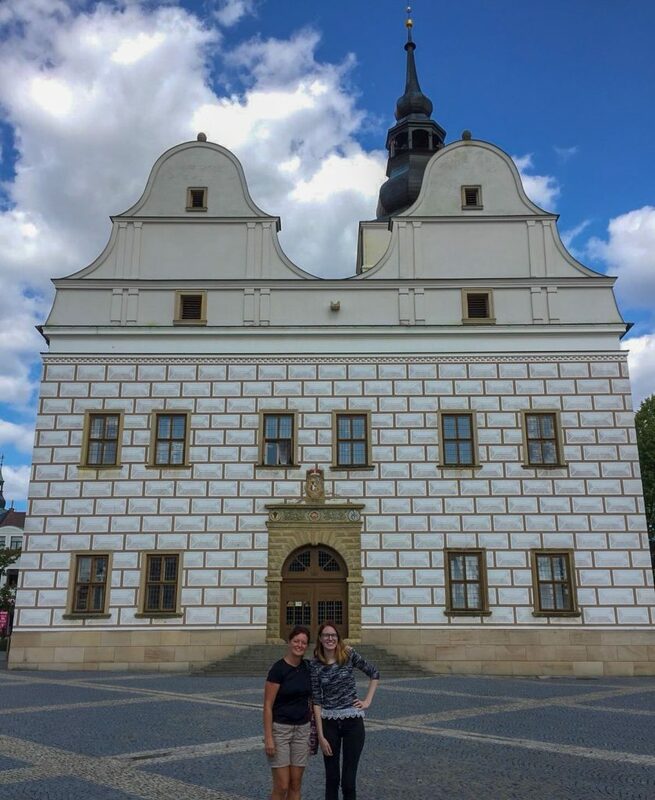 Niecea (right) and her mentor, Martina (left) in Lanškroun’s city square, Czech Republic, 2018 Fulbright program. Standing in the middle of the blacktop, watching my students play—the air brisk, the skies gray and the sun fighting to reveal itself—my pocket is furiously buzzing. I quickly grab my phone and remove it from my pocket in a panic, thinking it might be a parent calling or some emergency. While unlocking my phone, I see that there are two emails and a text message exclaiming, “Congratulations!” from two of my Fulbright recommenders and the Boston College Graduate School Fulbright Program Adviser. In wide-eyed amazement, I quickly scroll through my email, looking for a message from the Fulbright Program. To my surprise, I received a gift, a surprise on my birthday. For the very first time, one of my dreams had come to life. I am James Kale, II, and I will soon be embarking on a Fulbright English Teaching Assistantship (ETA) to Brazil! Katherine Long, 2016-2017, Tajikistan (right), playing a game with two young Tajik girls. For nearly ten years, Fulbright English Teaching Assistants (ETAs) have had the opportunity to volunteer with Reach the World (RTW) to share their experiences abroad with pre-kindergarten through 12th grade classrooms back home in the United States. RTW utilizes the power of virtual exchange to enable Fulbright ETAs, who apply to volunteer with RTW, to bring their host country into an engaged classroom of American students. Fulbright ETAs share many aspects of life in another country with their student audiences in the United States, from grilled meats in Argentina to the unique plant life in the Maltese archipelago. These talented, passionate recent college graduates and early career professionals also capture rare, extraordinary experiences, like visiting the remote Caño Cristales river in Colombia. As young learners from throughout the United States interact with Fulbright ETAs, they are building vital global competencies that will serve them for years to come while challenging their perspectives about the world and their role as citizens. These global competencies include such things as increased geographic literacy and a greater desire to travel, changes in empathetic thinking when encountering difference, and pursuing higher education opportunities. A year has passed since I completed my Fulbright English Teaching Assistantship (ETA) in Guadalajara, Jalisco, Mexico. As I reflect on this anniversary, I recognize that my Fulbright year had an immense impact on my personal and professional direction. I thought I knew what to expect from my Fulbright year. After all, I was a former student of International Relations, a USC Global Scholar. I had already lived abroad as an exchange student in Paris, France, and had spent weeks volunteering in Mexico and Peru. I knew what to anticipate from a year abroad, right? It turns out that I was very wrong. Every single day of my Fulbright award brought something new and unexpected. Never did I expect to have such an eye-opening experience. From the first day at orientation meeting my fellow Fulbrighters, to forming friendships with my mentors at the Universidad Tecnológica de Jalisco, to meeting local tapatíos (a word to describe the people from Guadalajara), I created lasting memories. In Guadalajara, also considered “the Silicon Valley of Mexico,” I encountered a forward-thinking city buzzing with technology and innovation. This is not exactly the vision I had of Mexico before arriving. All I knew of Mexico was folklore, border towns, and tourist resorts. I was surprised that so many young Mexicans I met were engineers, techies, and self-described ñoños (nerds). They worked at HP, Intel, Oracle, or a slew of Mexican startups like VoxFeed and CityDrive. It also seemed that everyone I met pursued passion projects outside of their 9 to 5 jobs, such as running Airbnbs and online businesses. I wanted to emulate these intelligent, proactive, and hardworking people in my life. Timorese students engaging in English language learning activities at UmaAmerika, the first American-style cultural center/library in the country featuring a high-tech design space and a platform to access scientific and research databases open to the general public. The Fulbright U.S. Student Program is pleased to announce that two Fulbright English Teaching Assistantships are now available to Timor-Leste for the 2018-2019 application cycle. 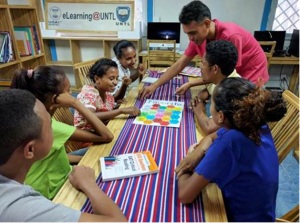 2018-2019 will be the first year in which the U.S. Department of State, in partnership with the Timorese government, will be sending Fulbright English Teaching Assistants to Timor-Leste. Timor-Leste became an independent nation in 2002, following over four hundred years of Portuguese colonization, twenty-four years of Indonesian occupation, and three years of United Nations transitional administration. The country faces the challenge of building a strong democracy and vibrant economy against a background of still-fragile institutions and limited human capital.